Kojo Senoo/Pipe Dream Photographer DIVEST BING is urging Binghamton University to become more financially transparent and divest from fossil fuels and partnerships with unsustainable corporations. Student members of DIVEST BING, a recently revived campus organization, are calling on Binghamton University President Harvey Stenger for financial transparency of the school’s $152,000,000 endowment. The University’s investments are handled by the Binghamton University Foundation, a nonprofit organization that is not required to disclose investment records or respond to requests made under the Freedom of Information Act. However, DIVEST BING, a student-run group campaigning for BU’s divestment from fossil fuels and partnerships with unsustainable corporations, is pushing for increased communication on all financial investments of the Foundation, and recently held a protest against Lockheed Martin, an aerospace and defense company. According to Anthony Georgiou, a member of DIVEST BING and a freshman majoring in anthropology, the group’s main focus is to urge the Foundation to clarify what the University invests in. “This group’s mission is to demand nothing less than absolute transparency in regard to the Binghamton Foundation’s use of the annual endowment of Binghamton University,” Georgiou wrote in an email. The group initially formed in 2013 after news arose that the Foundation leased 600 acres of land to companies for hydraulic fracking in 2008, and was part of Intellectual Decisions on Environmental Awareness Solutions (IDEAS). Eventually, it went dormant. Ava Glasser, president of IDEAS and a senior majoring in environmental studies, wrote in an email that the group disbanded after it failed to attract new members and saw little progress. The group is now a larger coalition of more than 40 students from multiple environment-related student organizations, including IDEAS. Isabel Jordan, co-founder of DIVEST BING and a freshman majoring in philosophy, politics and law, wrote in an email that she was inspired to reactivate the group after creating a series of environmentally based workshops in February. Jordan wrote that the group has expanded its previous focus to fit a variety of issues the group hopes to target, including human rights violations. “While the previous iteration of Divest Bing focused solely on fossil fuels, we recognize that the U.S. Department of Defense is the world’s largest polluter, that war affects land and ecosystems and that the global destruction of cultures and livelihoods erases traditional sustainable practices,” Jordan wrote. Last week, about 20 members of DIVEST BING protested an on-campus job recruitment event hosted by Lockheed Martin, the world’s largest weapons manufacturer. Members argued that engineering students should not be pursued by companies involved in wars overseas that are detrimental to people and their environment. “Undergraduate students looking for solid jobs shouldn’t be targeted by war profiteers; their talents should not be appropriated in order to more effectively kill,” Jordan wrote. Dheiva Moorthy, co-founder of DIVEST BING and a freshman double-majoring in environmental studies and sociology, wrote in an email that the group is hoping to expand further to educate students on topics including environmental campus reform and ecofeminism. 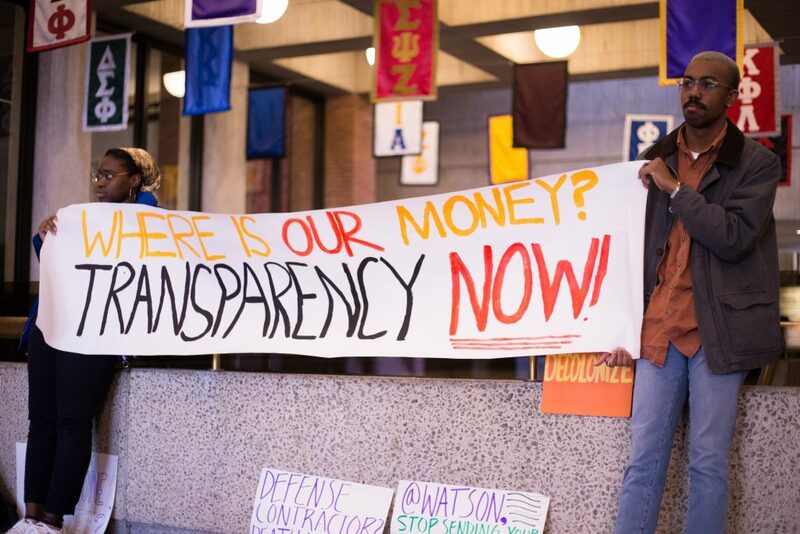 Additionally, she wrote that the group plans to continue fighting for transparency of the foundation’s financial records to ensure proof of the University’s divestment from fossil fuels. “We firmly believe in student-led direct action to achieve progressive goals — divestment of Binghamton’s resources in questionable and problematic industries is one of these goals,” Moorthy wrote.